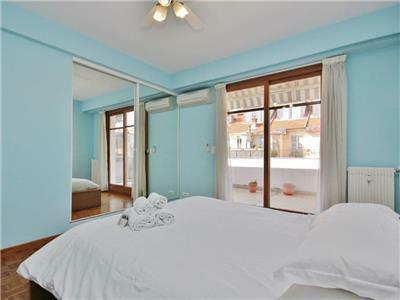 All the rooms have large sliding doors leading to the terrace and all rooms are air-conditioned. Dining can be taken outdoors on the table and chairs provided. There is also outdoor lounging furniture on which to take the sun and when things get too hot, there are full-length retractable sun blinds to provide shade. 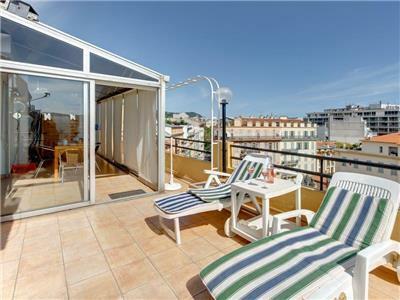 The apartment is very convenient to the railway station for trips along the Riviera and there are lots of shops, cafes, restaurants and patisseries (for your morning croissant on the terrace) nearby. 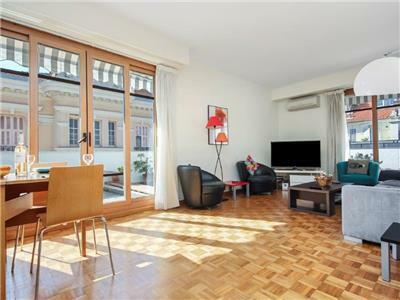 This apartment has a truly relaxed and comfortable feel. 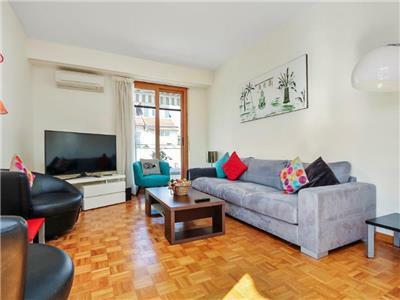 The large living room has a big screen TV (English satellite TV including BBC, ITV, CNN and Sky news) it has free internet/wifi (fibre optic - so very fast) a mini home theater system, a double sofa-bed and two armchairs. The master bedroom has a high quality super-king size bed and fully fitted cupboards. 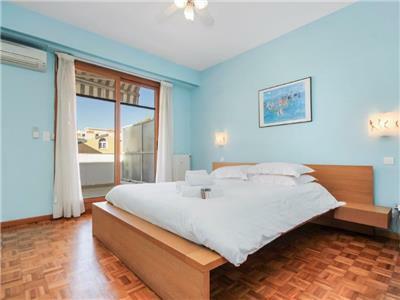 The second bedroom has two high quality single beds that can be pushed together, as well as its own fitted cupboards. 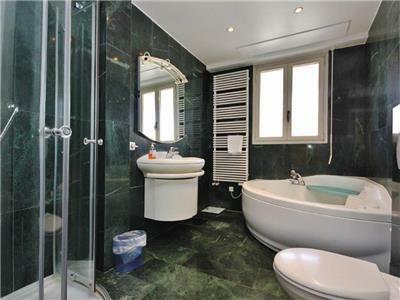 The main bathroom is stunning. 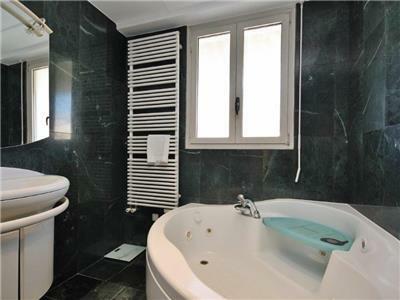 It has a deluxe corner bath and separate shower cubicle, with quality marble tiling throughout. 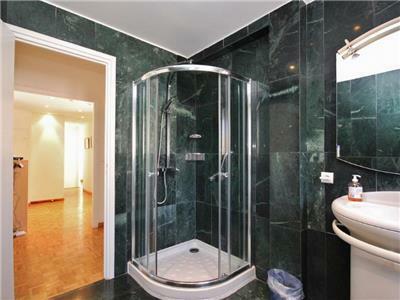 There is also a further separate shower room next to the second bedroom. 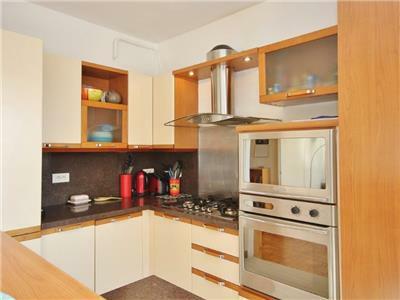 There is a fully equipped 'American' kitchen, with oven, hob, microwave, washing machine and dishwasher. High speed Internet is provided via Wifi and Ethernet port - this is fibre optic so very fast. 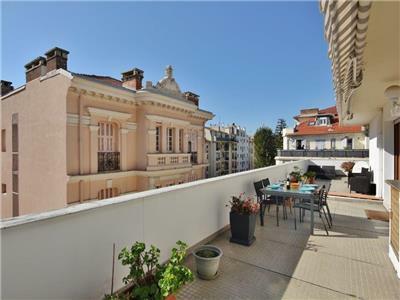 This is an exceptionally comfy apartment, but what makes its unique is the surround terrace. 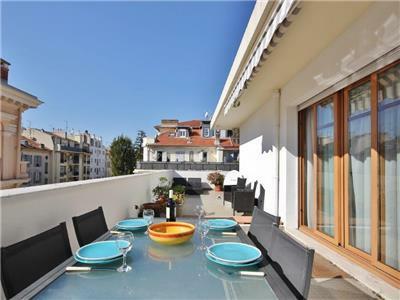 This is south and west facing, so there is sun throughout day and evening, with views of the city and hills. 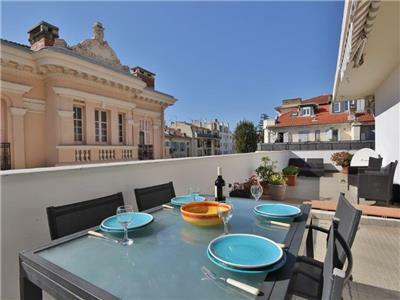 This apartment is perfect for a family or two couples sharing -- great location and stunning terrace. 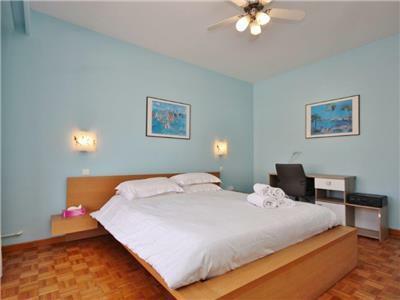 This apartment comes with linens and towels and beds made-up accordingly for 4 persons. Nice central train station	 Train Station 390 m.
Negresco Hotel	 Hotel Motel 764 m.
Place Massena	 Tourist Attraction 872 m.
Cours Saleya	 Tourist Attraction 1289 m.
Old Town	 Tourist Attraction 1442 m.
Place Garibaldi	 Tourist Attraction 1548 m.
Castle Hill	 Tourist Attraction 1.74 km. Nice Port	 Tourist Attraction 1.91 km. Promenade des Anglais	 Tourist Attraction 2.06 km. Have stayed at rue Gounod twice now.the apartment. was great and had everything we needed,location was good.the balcony was great with sun all day long.we stayed here with our friend ,and we all had our own space. What a joy to stay in an apartment with everything you could possibly need. Huge South facing balcony sun from early morning to late in the evening. vast amount of room to lie in the sun all day. 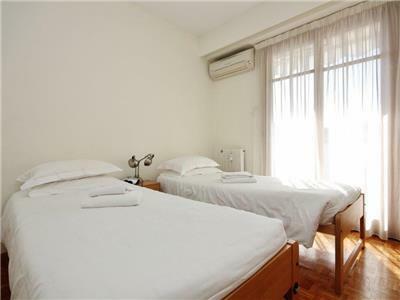 Rooms are big and air conditioned. There is Sky ( English TV ) and free Wi Fi. What else could anyone need. 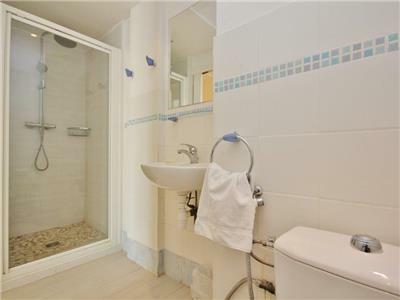 Close to the Train Station and just a 10 minutes walk to the beach. It is a magnificient apartment. The photos are exactly as it is when you arrive. Go Nice are a very pleasant and accommodating company and will try and sort out your problems quickly. Collection of key at airport was flawless together with instructions on location of apartment. 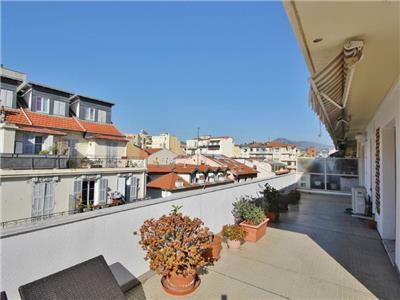 Found apartment to be as described by agent, excellent condition. We enjoyed having access to the large balcony. Location was good for transport, and shops for the essentials. Several wonderful bakers nearby. All in all we enjoyed our stay. 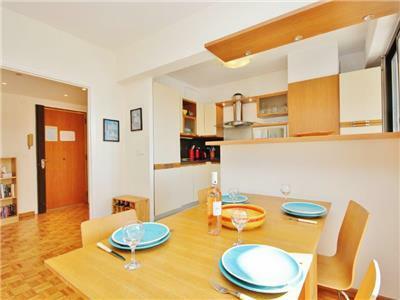 The apartment was roomy, and designed well for privacy with bedrooms at opposite ends of the apartment. The kitchen included all amenities, and the welcome basket was very welcoming! Not speaking French was a distinct disadvantage in this regard. The terrace was lovely. The neighborhood was charming, with nice mini markets, and some wonderful neighborhood restaurants. We were able to walk to many local sites, and took two half day and two full day tours. The only places we weren't able to visit - for lack of time - were the Chagall and Matisse museums. But we had a grand time! 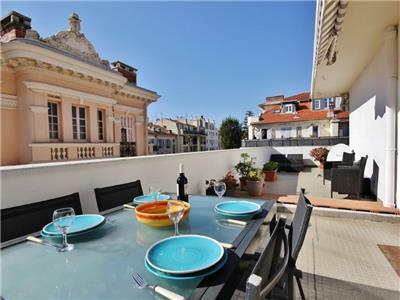 Who knew that Nice has been part of France for only 150 years, and has such a strong Italian influence. The fusion of the two cultures was wonderful!